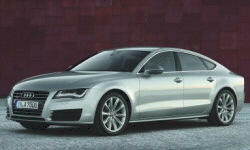 Audi A7 / S7 / RS7 Pros and Cons | Page 1 of 1 | Why Not This Car? What drives people to buy (or not buy) a certain car? TrueDelta's members share Audi A7 / S7 / RS7 pros and cons based on their real-world driving experiences. Want to not sell a car to Americans? Make it a hatchback. Better yet, make it a diesel-powered hatchback and price it $11,000 higher than its gas-powered sedan counterpart. Performance and handling, sporty and luxurious. This is a car I love to drive and gives me great satisfaction to own. I look forward to every opportunity to drive this car. It is performance minded and very comfortable on long road trips.